1. The end of governing by crisis? 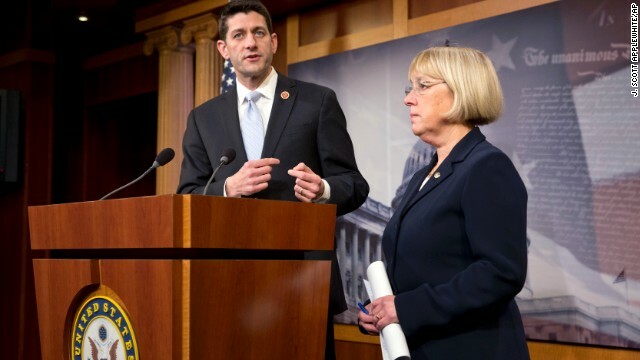 The budget agreement brokered by Sen. Patty Murray (D) Washington and Rep. Paul Ryan (R) Wisconsin, sets spending at a trillion dollars for the next two fiscal years and would avoid another government shutdown. The deal also eliminates $63 billion in forced spending cuts that were set to kick in early next year and aims to reduce the deficit by $23 billion. But the agreement still has to get through Congress. While many Democrats are concerned the deal doesn't include an extension of unemployment benefits and some Republicans don't think the spending cuts go far enough, overall opposition from lawmakers has been muted. Perhaps the first sign in a long time that compromise is actually possible in Congress. 2. Boehner lashes out. When asked about the strong opposition to the proposed budget deal from conservative grassroots groups, House Speaker John Boehner wasn't sympathetic. "They're using our members and they're using the American people for their own goals," Boehner said. "This is ridiculous. Listen, if you're for more deficit reduction, you're for this agreement." Groups like Americans for Prosperity, Freedom Works and Heritage Action have previously been successful in pressuring House Republicans not to compromise on budget issues. 3. GOP'S right-flank/Tea Party problem. Seven Republican senators who are up for re-election in 2014 are facing primary challengers from the right and GOP officials are concerned it could hurt the party's chances of gaining control of the Senate. Republicans effectively gave away five Senate seats the last two cycles because of candidates who weren't capable of winning in November," said Brian Walsh, a former communications director for the National Republican Senatorial Committee. The seven facing primary fights are Senate Republican leader Mitch McConnell of Kentucky, Lindsey Graham of South Carolina, Lamar Alexander of Tennessee, Thad Cochran of Mississippi, Mike Enzi of Wyoming , Pat Roberts of Kansas and John Cornyn of Texas. 4. Obama's 2013 dive. After a steady decline in the last half of this year, President Obama is ending 2013 with some of the lowest approval ratings of his presidency. CNN's average of seven national polls released over the past 48 hours, finds only 42% approve of the way he's handling his job, while 53% disapprove. How does Obama's approval ratings compare to his most immediate two-term predecessors? "President Obama gets significant worse numbers than Bill Clinton and Ronald Reagan did at this time in their second terms," said CNN Polling Director Keating Holland. "But Obama is slightly outpacing George W. Bush, whose rating had dropped to the upper 30's by the end of 2005." 5. A red New Jersey? If Chris Christie does decide on a 2016 White House bid, a new poll suggests the New Jersey governor could bring the Garden State into the Republican column. According to a Monmouth University/Asbury Park Press Poll survey, Christie holds a 46%-43% edge over former Secretary of State Hillary Clinton in hypothetical 2016 general election contest. The poll also found that 69% believe Christie is already planning a presidential run and would not be upset if he stepped down as governor to do so.